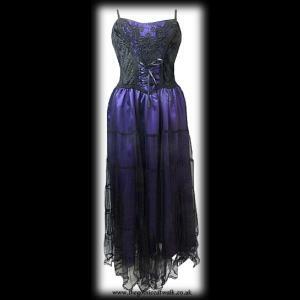 A beautifully shimmery long gothic dress from Dark Star. 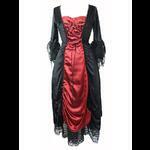 The bodice has black velvet panelled sides and a ruched velvet back enabling the dress to fit a range of sizes. The centre front of the dress has a purple silky panel covered with black applique and ribbon corset lacing. The skirt section of the dress is made from purple silky fabric and is entirely covered with a layer of soft, floaty black mesh. Adjustable elasticated shoulder straps.